Fuerte Santo Domingo or Fort San Domingo was originally a wooden fort built by the Spanish in 1629 at Tamsui District, New Taipei, Taiwan. Fort San Domingo was built by the Spanish in 1628 after which the present site of the Fort was named. On a night in 1636, a group of local people, angered by the taxes that the Spanish governor had imposed, successfully attacked the fort and demolished it. In 1637, the Spanish rebuilt the fort using stone and raised the walls' height to twenty feet or more. In 1642, the Dutch expelled the Spaniards from nearby Keelung. The Spanish fort in Tamsui had by then already been razed by the Spanish themselves. The Dutch built a new fort on the site, called Fort Antonio. 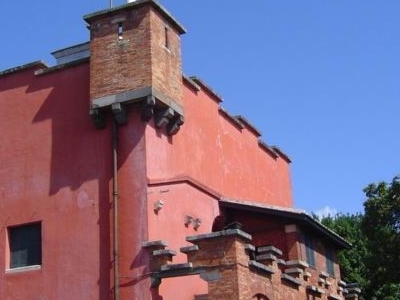 In 1644, they replaced it with the structure still standing today, also called Fort Anthonio. The locals called the Dutch "the red-haired people", which led to the compound's Hokkien name (Chinese: 紅毛城; Pe̍h-ōe-jī: Âng-mn̂g-siâⁿ; literally: "fort of the red-haired"). From 1683 to 1867 the Qing Dynasty Chinese government controlled the fort and during this time (1724) built a stone wall with four gates around it, of which only one, the main gate, survives. Following the Second Opium War, in 1868 the British took over the fort, made it their trade consulate, and painted it red (it was previously white). The linguist Herbert Allen Giles resided in the fort from 1885 to 1888 and completed some of his work on the Wade-Giles system of romanization of Standard Chinese there. Next to the fort the British built their consular residence in 1891. The consulate closed during World War II and reopened after the end of the war. The Republic of China (ROC) government retrieved the land from the British in 1980, several years after the United Kingdom broke off diplomatic relations with the ROC in 1972. 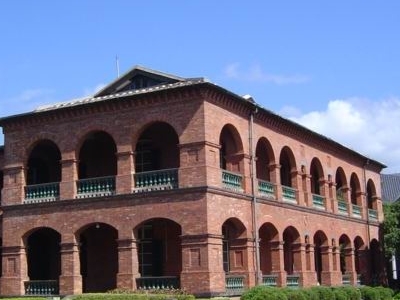 The ROC government has classified the Fort a grade one listed historical site and it is now a museum with the interior recreated from photographs. It was reopened after refurbishment in 2005. Now referred to as the Former British Consular Residence, it is a popular tourist attraction. The Fort is adjacent to Aletheia University, which traces its origins back to 1872 when the Reverend Dr. George Leslie Mackay, a Canadian Presbyterian, established a mission and then a medical service and a school. The Former British Consular Residence is an elegant Victorian house fused with some Chinese elements. Also, this location provides a beautiful outlook on Guanyin Mountain and the Tamsui River. The fort is open to the public Tuesday – Sunday, 9am – 5pm. There is no charge for admission. The fort is accessible within walking distance North West from Tamsui Station of the Taipei Metro.